For the fries, use Russet potatoes or sweet potatoes. Cut into uniform slices. Toss in oil, salt, pepper and any of your favorite spices (C likes Old Bay on his fries). Bake at 400-425 degrees turning every15-20 minutes until cooked through and golden brown. Brown ground turkey with your favorite taco seasoning. Prepare toppings. We made spanish rice from the box and I heated up some black beans for C. He made his into a burrito bowl (like from Chipotle) and I ate mine with some delicious homemade tortillas from Central Market. Heat 3 tbsp olive oil and 3 tbsp butter in a large skillet. Add chopped garlic and red pepper flakes to taste. Add 3/4 lb shrimp. Cook until just pink. Add 1/2 cup lemon juice and maybe a splash of dry white wine. Reduce as the shrimp finish cooking. 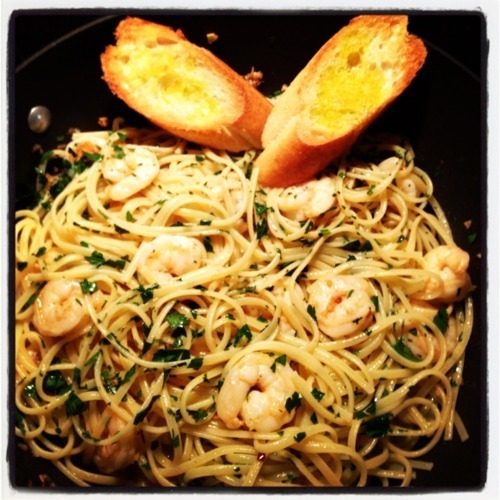 Toss with linguine and parsley. Between these three meals, we had some leftovers so we ate off those (well C ate those) for the most of the rest of the week. I think there was a turkey sandwich and some plain pasta tossed in there. But all in all, we’ve lasted over about 10 days without eating a meal out!